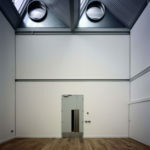 The organisation of the studios around a generous corridor is a traditional art school arrangement and echoes the typology of the Royal Academy and V&A. 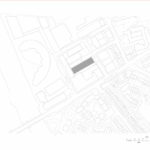 This device provides both a social space and temporary exhibition venue, where everyone moves through the work of other students, past and present. From the very first conversations, the aim has been to create contemporary studio spaces to match the quality and character of the very best traditional painting studios in London, such as the generous Victorian studios at the Victoria & Albert Museum (V&A) or the inspirational spaces by Sydney Smirke and Norman Shaw at the Royal Academy. 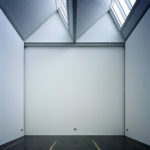 Prior to 1991, the Painting Department was housed in generous purpose-built studios at the V&A in Exhibition Road. The subsequent transition from custom-made Victorian premises – with huge windows and a mural room – to the smaller and lower-ceilinged studios of the college’s Kensington campus proved a challenge, as the replacement studios were unable to replicate the marvellous V&A spaces which dated back to the days of Henry Cole. 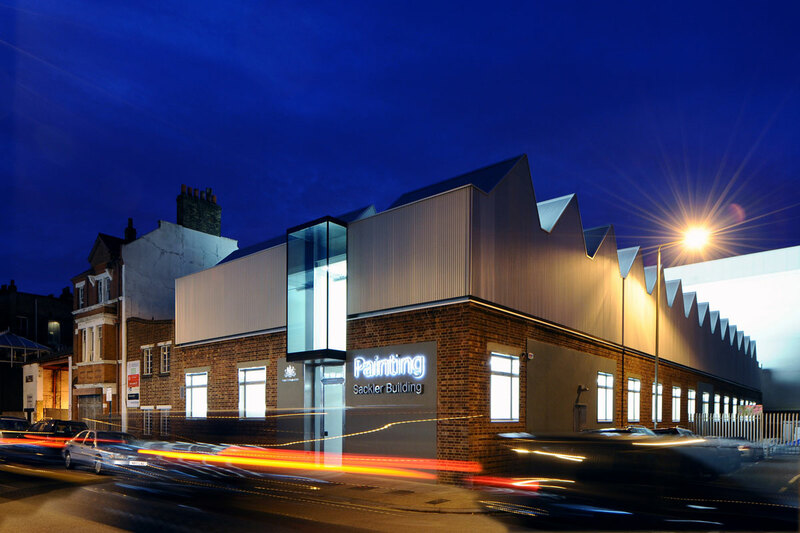 The new Sackler Building in Battersea has now provided a rare opportunity to move Painting back into the generous, lofty, well-lit accommodation it requires. The Sackler Building was always conceived as a conversion: the old building – a single storey factory – has been transformed into a series of new day-lit spaces under a dramatic new roof form through the insertion of an independent steel structure within the existing brick enclosure. 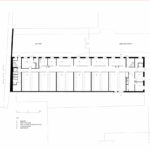 This has significantly increased the height of the building, providing several double-height (7m) studios, together with a mezzanine level housing a number of smaller top-lit 3.5m high studios, while retaining a predominantly open-plan environment. 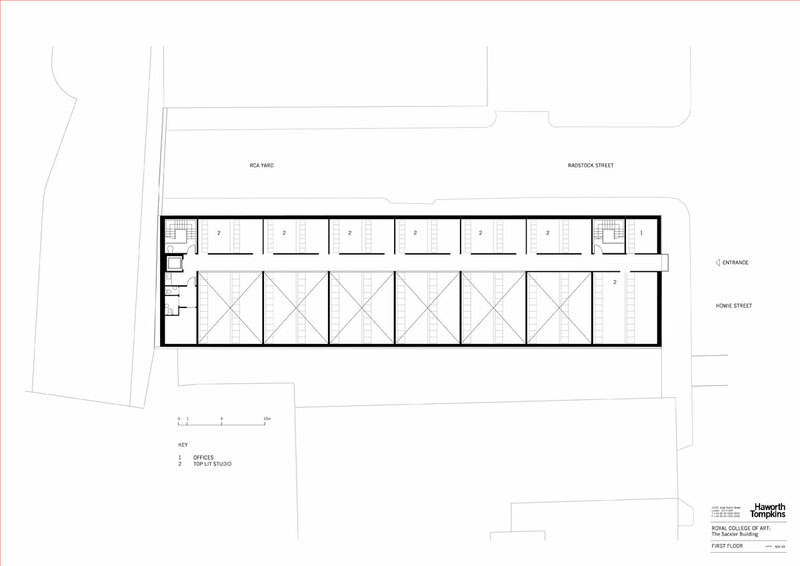 The plan form of the new building is based on a simple arrangement of spaces: six double-height, top-lit studio spaces are arranged, in series, off a wide (2.6m) central corridor space, which also serves a row of side-lit studio spaces; a galleried mezzanine floor overlooking the double-height studios provides access to an upper level of smaller top-lit studios. 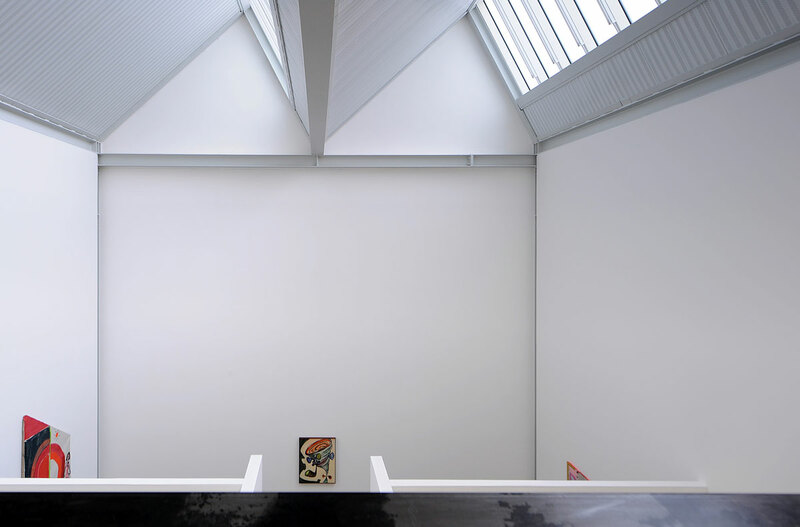 The specially profiled roof allows much needed north light to be achieved throughout without direct glare from the sun, providing ideal studio conditions for painting. 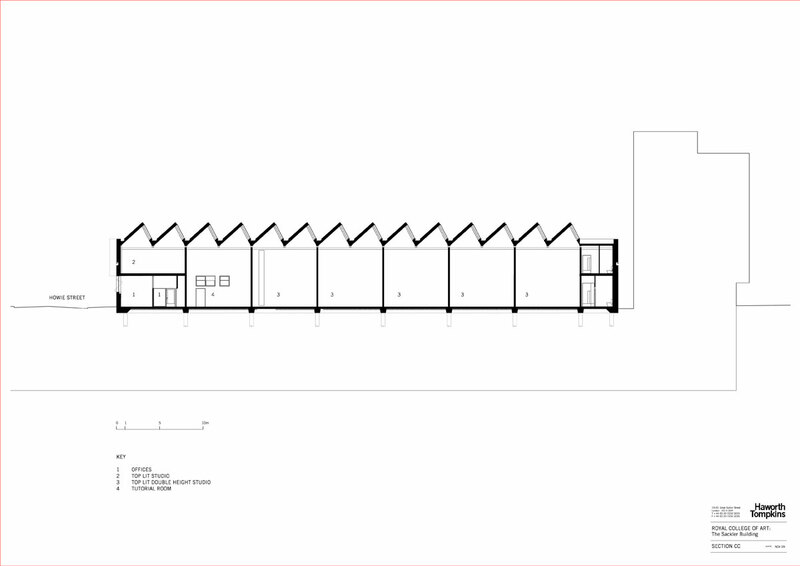 The large studios are almost cubes: 8m x 7.5m in plan and 7m high, and can be subdivided into as many as 6 individual studio spaces if required. One of the large top-lit double-height studios is a designated tutorial room which will also be used for exhibitions and lectures. A secure workshop for frame making and an open workshop for cleaning brushes are located at the north-end of the corridor. 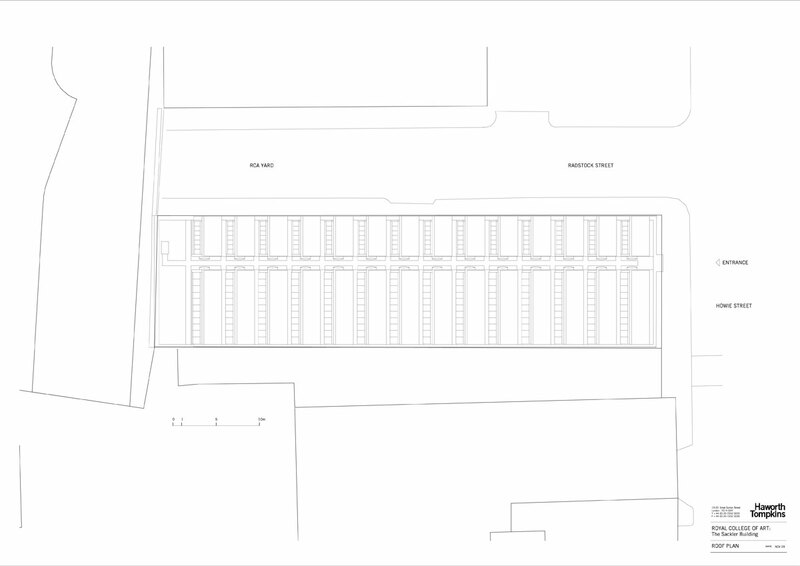 With the exception of a few cellular offices and the tutorial room, there are no internal doors in the building and all spaces interconnect in one large compartment served by the central corridor and gallery. It is therefore possible to “to move freely from space to space and see paintings, drawings and art objects being worked on, the sights, smells and sounds of a dynamic working environment. 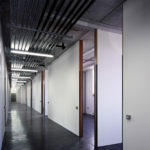 The interior has been designed to be sufficiently robust to take the knocks administered through the daily activity of painting: the openings to the studios are lined with rough sawn oak reinforced with raw steel angles; handrails and balustrades are mild steel finished with beeswax; the floors are sealed concrete; all ready to take the layers of colour, splatter and drip that will build up over time to slowly inhabit the neutral white interior. Two large staircases at each end of the building are designed with large central wells to allow canvases to be hoisted up to the mezzanine studios. 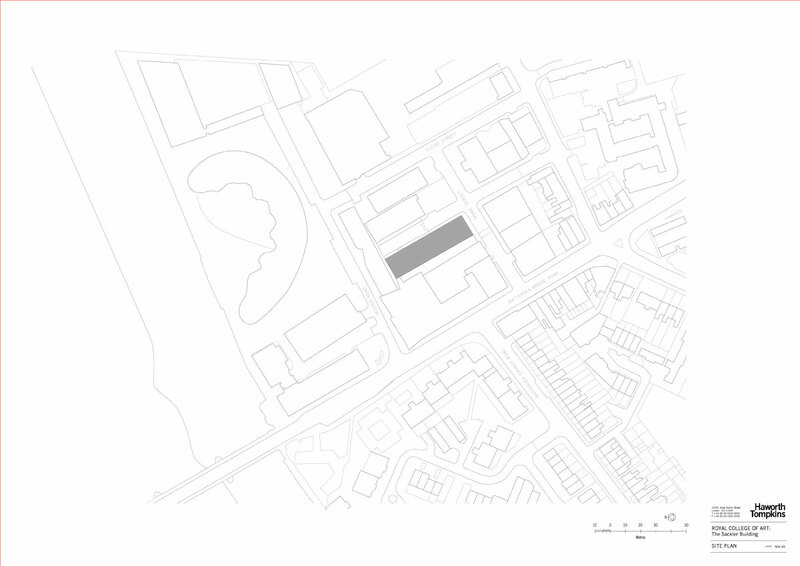 The technical solution to the programme of inserting a new structure within the shell of the existing building became the generator of the conceptual design of the building. This was expressed in a conceptual study model, which in turn became a touchstone for subsequent design decisions. The retention of the brickwork façade was established mainly for cost and programme reasons, but it also provides a material link to the building’s former industrial use and enabled us to exploit the poetic potential of regeneration and re-use; as such the building has the feel of a conversion – a factory that has been appropriated for Painting use. This notion of found spaces resonates well with the Department’s aspirations for a working environment. The ‘inserted’ accommodation sits above the datum created by the existing brick walls, and being shiny, metallic and industrial contrasts strongly with the masonry language of the base. 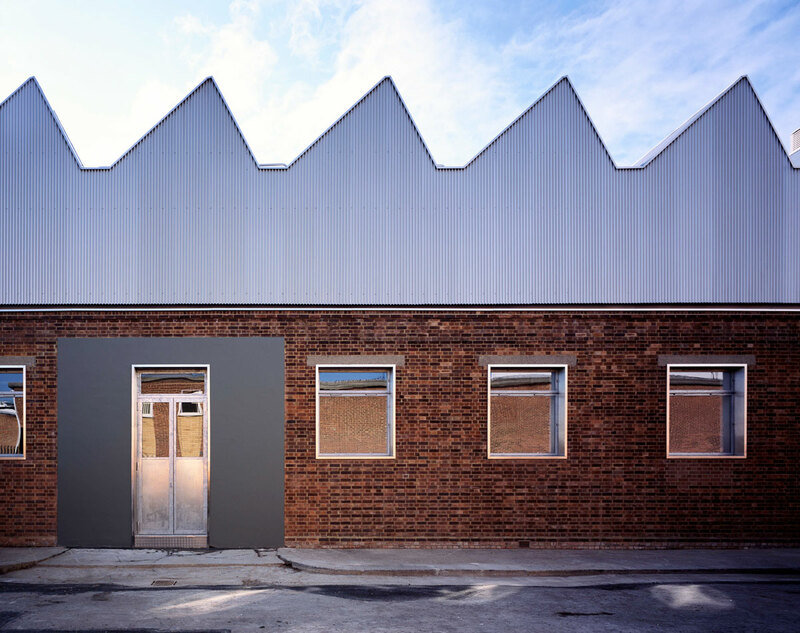 The new roof expresses the form of the north facing roof lights but is predominantly mute and enigmatic, revealing little secondary scale or articulation. A sinusoidal metal profile was chosen to reinforce this concept, to capture light in a uniform way, and to enable the suppression of panel joint lines into a uniform homogenous surface. 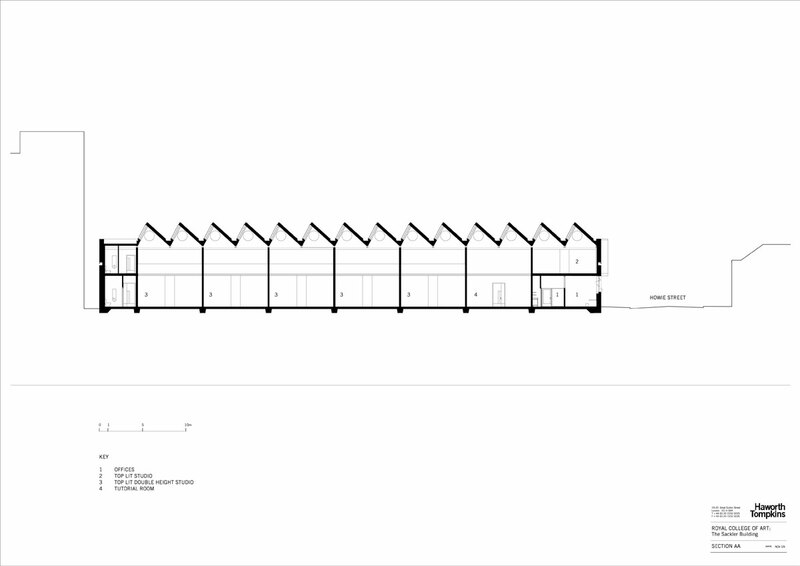 The only place where the roof form is broken is at first-floor level where the main circulation gallery projects over the street in the form of a glass box that expresses both the main entrance and the organisation of the building around the central corridor. 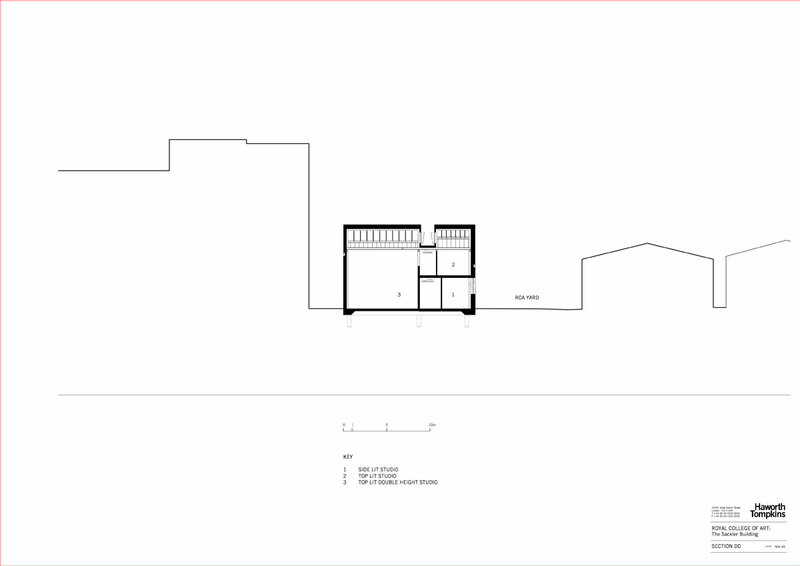 The brickwork base of the external wall remains essentially as found but with the windows lowered to allow more daylight to penetrate the side-lit studio spaces. 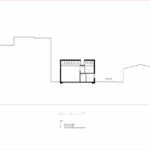 The top of the existing window heads effectively dictated the level of the underside of the new first floor level at 3.5 metres and provided a generous proportion for the ground floor studios. Where new interventions were made in the façade or old openings were concealed, they are clearly defined through the use of applied render panels. The new galvanized steel windows are set within stainless-steel window linings. 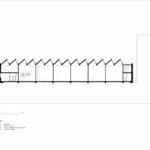 In designing a simple building the technical design of the building services is critical, ensuring that the form of the building follows the lead and discipline of the technical design. 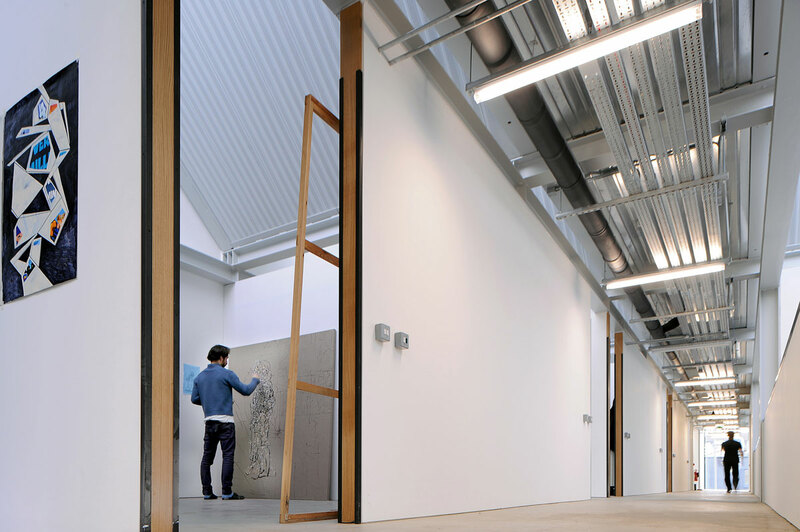 Engineer Max Fordham were instrumental in developing the two key environmental design principles, that the building should be naturally ventilated and that the lighting – both natural and artificial – was optimised for painting. There are several criteria for consideration in the design of studio day lighting these are; high light levels; consistency of light with variation over time minimised; avoidance or minimisation of direct sunlight penetration, high colour rendition, and a degree of directional lighting to achieve good levels of modelling. 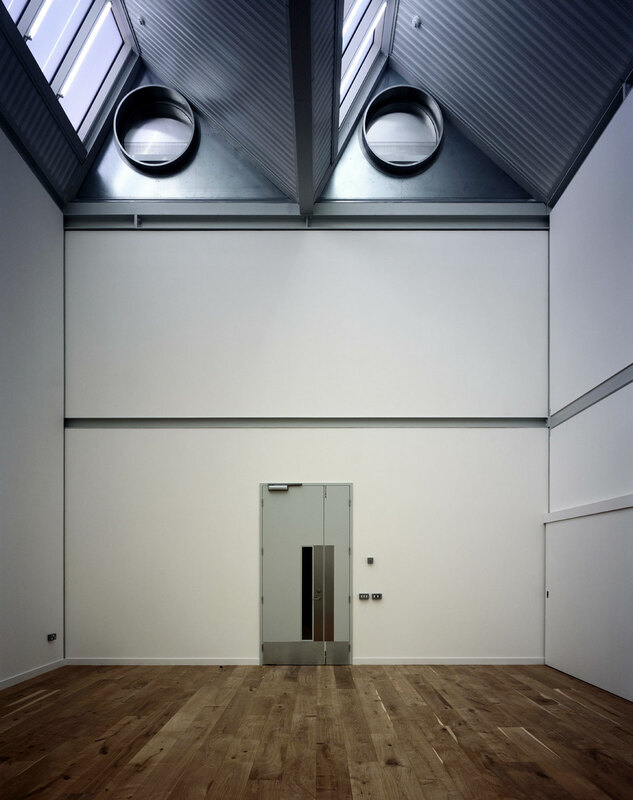 The daylight provision to the studios was developed with reference to the 19th Century studios at the Royal Academy Schools in London. 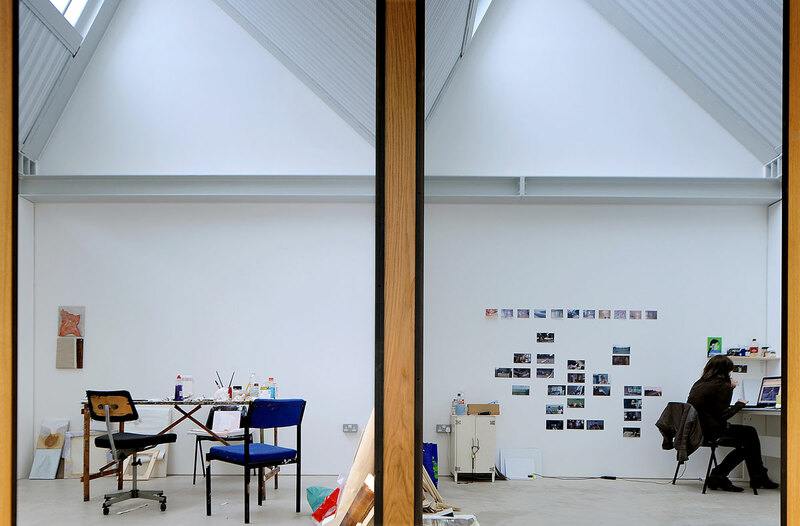 These studios are generally recognised as being exemplary in the lofty form of the space and the consistency in light levels achieved through exclusively north light. 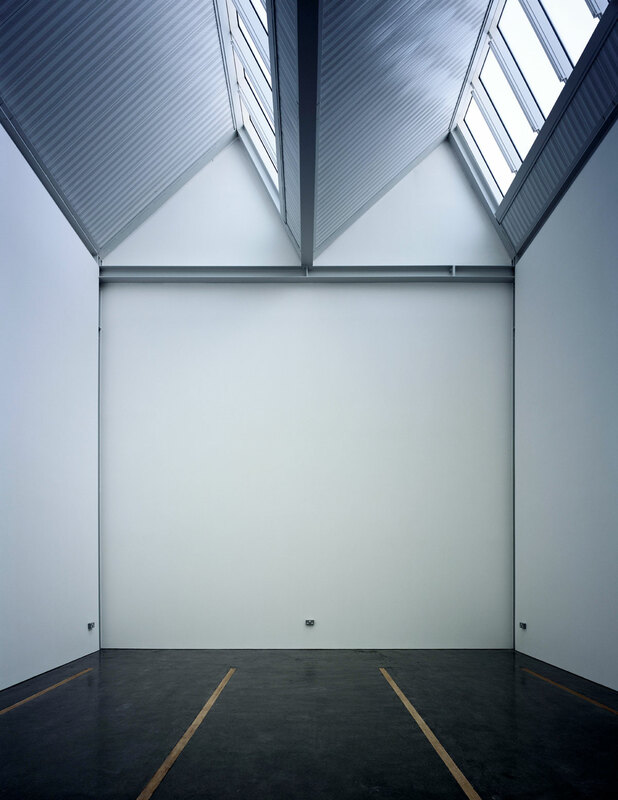 The four Royal Academy studios have high daylight levels; the daylight factor at floor level are 4%, 7%, 10%, and 16% at floor level. A large-scale model was constructed and tested under an artificial sky to quantify the daylight factor in each main studio type. Daylight factors represent the level of light within a space as a percentage of the total light measured at roof level without any obstructions or neighbouring buildings. 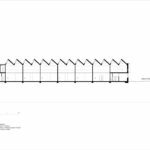 The proposals were tested with both clear and diffusing glazing options; for the large ground floor top lit studios and the smaller first floor top lit studios an average daylight factor at floor level of 10-11% was achieved depending on the exact specification of the glazing. The walls averaged 8% in the working area. 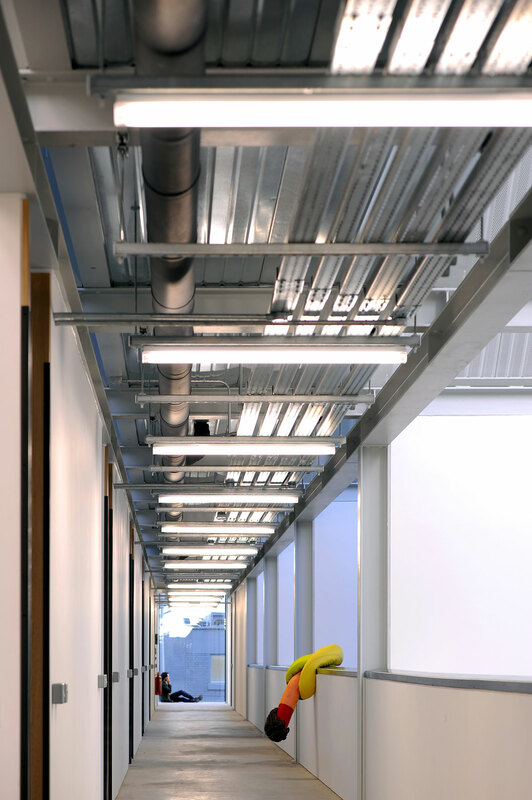 The ground floor side lit studios provided an average daylight factor at floor level of between 5-9% depending on the exact specification of the glass and 8% on the walls in the working area. The rooflight glazing was surface textured to diffuse westerly sunlight for limited periods of the year when it enters through the rooflights. Various roof profiles were also explored which looked at the differences between single rows and double rows of roof lights, and individual lanterns. 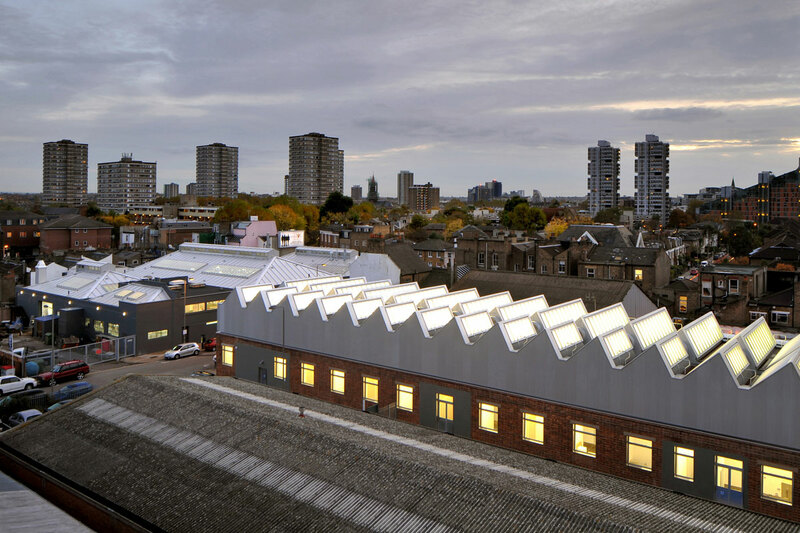 The chosen profile was a double row of north facing lights per structural bay which provided the highest level of daylight factor and allowed the small studios to retain an individual roof light if subdivided. 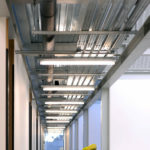 Artificial lighting is used to supplement the natural daylight through a series of intermediate colour temperature (4000 Kelvin) fluorescent lights which can be incrementally switched on 30% at a time; the light tubes are placed on the sloping glazing bars of the rooflights so that the light always emits from the same source. The building operates on the principle of natural ventilation based on air movement from low-level windows up to the circular roof vents in the apex of each roof bay. 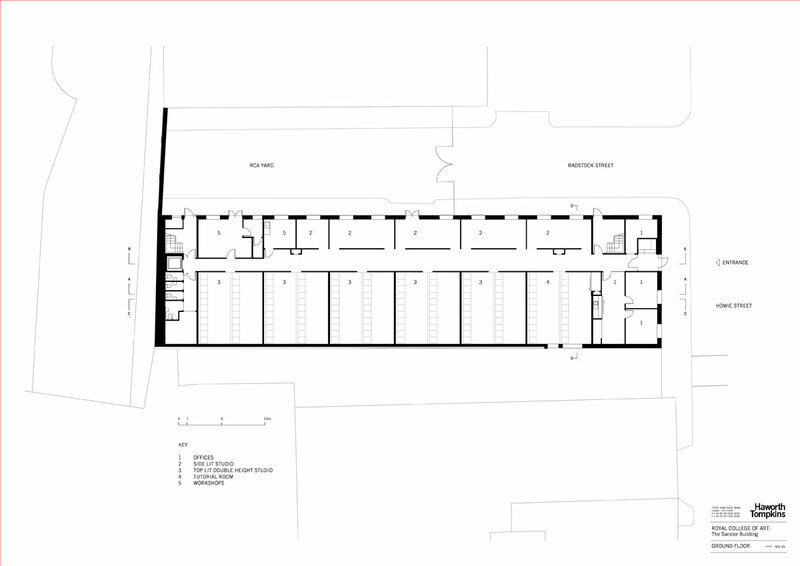 The scheme works as the studios are all interconnected and there are no doors between the spaces. The natural ventilation principle aims to avoid the internal air temperature exceeding the external by more than 2oC by the use of exposed thermal mass and solar control glass in conjunction with night- time ventilation. 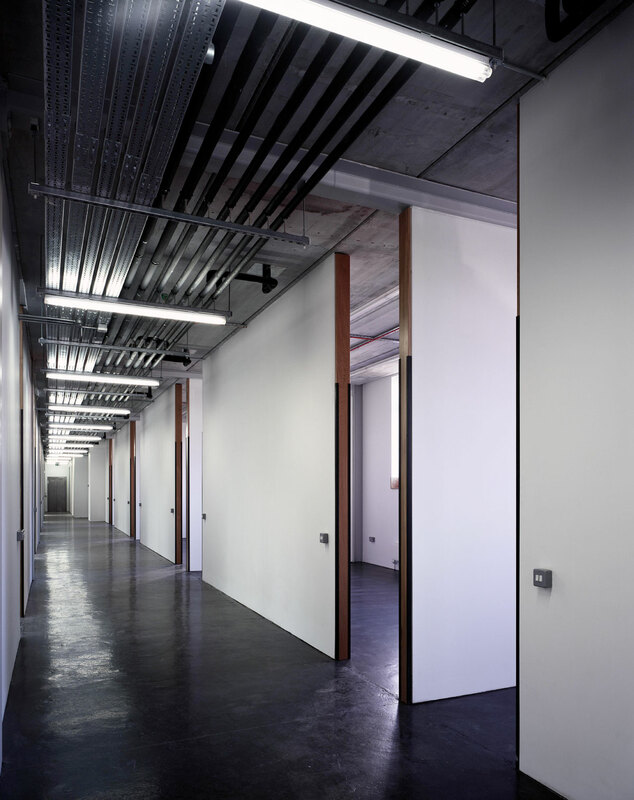 The ground floor studios are the main source of the fresh air intake and have two vents the upper of which stays open at night in summer to enable secure night-time cooling of the space; the mezzanine and double height studios have large circular opening vents. 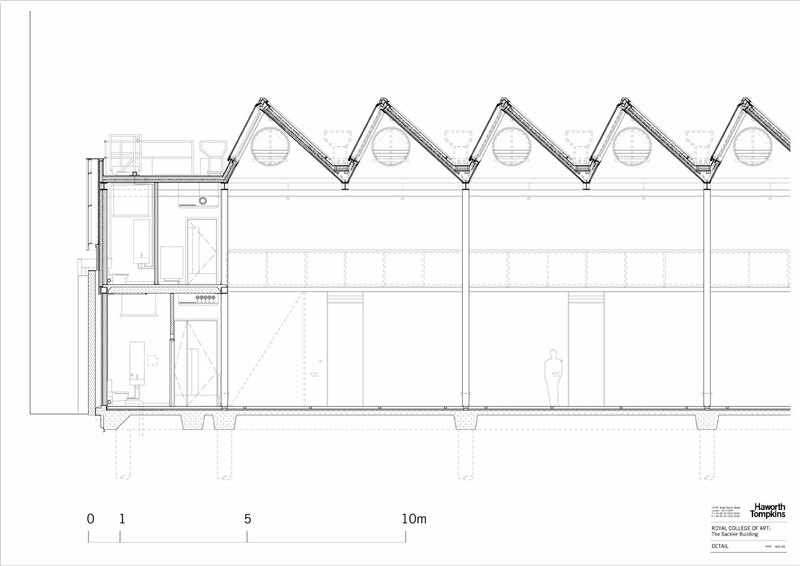 Originally the high level vents where to be located in the sloping roof lights but as the vents are left open for night purging of the building in summer there was thought to be a risk of rain penetration into the studios so a system of cowelled openings in the vertical faces of the roof was adopted instead. 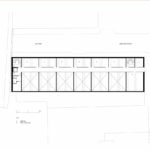 The large 7 metre high studios are designed with underfloor heating as it provides a uniform low level of heating at occupant level. As the heat emitter – the floor- is at a lower temperature, the stratification in the space will be less and a temperature sensor in the occupied space will provide a good level of heat output. The smaller studios are heated by a traditional wet radiator system. All services distribution routes exposed in the central corridor space for easy upgrade and access. 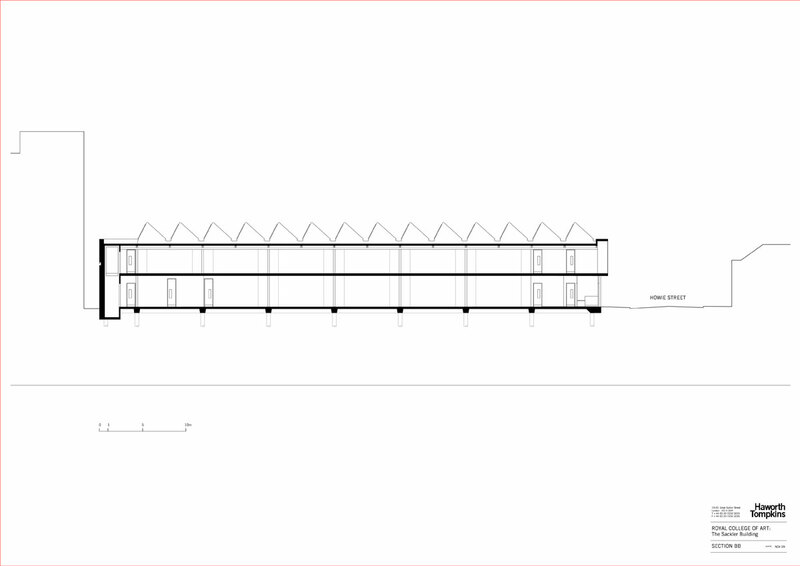 The area of the new building envelope is roughly double that of the existing warehouse and the technical solution to the programme of inserting a new structure within the shell of the existing building was developed by Structural Engineer Price & Myers. 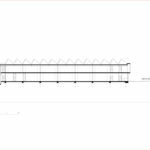 The sub structure is a suspended ground floor slab on a piled ground beam system, which in turn supports the new steel frame structure above. 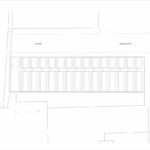 The new steel frame structure provides the dual role of bracing the existing perimeter walls as well as providing the free spans necessary for the large studios. The frame is braced in one direction and relies on portal action in the other. For ease and speed of construction a pre-cast concrete mezzanine floor was used together with pre-cast concrete staircases. The roof structure is of ‘saw-tooth’ form and utilises a prefabricated system of perforated metal lining panels and glazing bars to span between the principle structural members on the principle grid-lines. Cite this article: "The Sackler Building / Haworth Tompkins Architects," in ArchEyes, June 30, 2016, http://archeyes.com/sackler-building-haworth-tompkins-architects/.